From above in more ways than one. 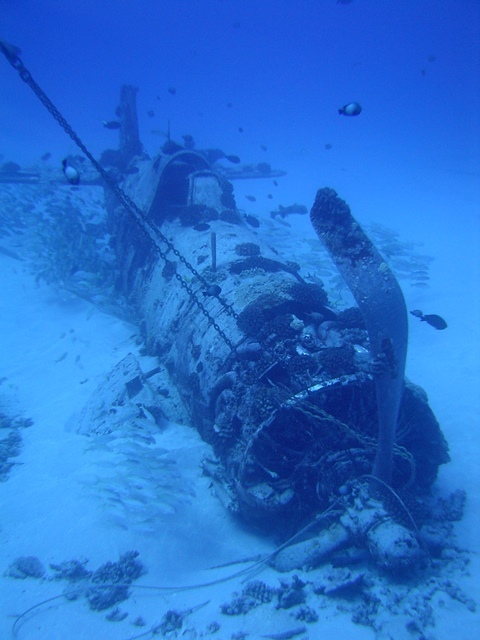 This Corsair plane is the only natural wreck that recreational divers can visit on Oahu. All others were either intentionally sunken as artificial reefs, protected as memorials or are in too deep of waters for recreational divers. I’ve been told that while on a test flight around the island after WWII, the pilot ran out of gas and ditched the plane in Moanalua Bay. As far as I know, the pilot survived the crash and the plane has become a famous dive site in Hawaii. The plane sits at about 107 feet below the surface surrounded by a field of garden eels. Plenty of marine life such as squirrelfish, starfish, damselfish, nudibranchs and octopus have made this wreck their home. I’ve even spotted a tiger shark above this wreck once. The thought of seeing that shark still gives me goose bumps! Interested in the Weekly Photo Challenge? Follow the Daily Post to get the weekly theme every Friday. Make sure to tag your posts with “postaday” too. Posted by jingerventures on May 6, 2013 in All adVentures, Hawaii and tagged adventure, Corsair, Corsair Wreck, Diving, Hawaii, Oahu, Ocean, Postaday, Scuba Diving, Shark, Weekly Photo Challenge, Wreck Diving, WWII. A perfect theme for your photos. Great photos! I miss diving. Hope to be able to go soon!